I am sending you a few pictures of my just launched Njord. It is a wonderful boat, and everything you said. Lots of room for knees under the deck with the small cockpit, and no problems getting in or out. I am glad I did not raise the deck any, and that I did the small cockpit. I can see what you mean by a soft, predictable motion. When properly braced with my knees against the deck I feel comfortable and in control. Waves from side or rear quarter are no problem as I can feel the boat responding smoothly to them. No sudden twitches. It does need the retractable skeg for touring, as you said it would. The skeg makes it easy to tune the boat to different conditions. This morning I took the boat to a lake and had my first rolling and bracing session. It rolls easier than any other boat I have ever used. I did a couple of wet exits as well to make sure there would be no problems with the small cockpit. There were none, and the fit of the little cockpit makes rolling much easier. Length overall is 18 feet, and weight is 34 pounds. 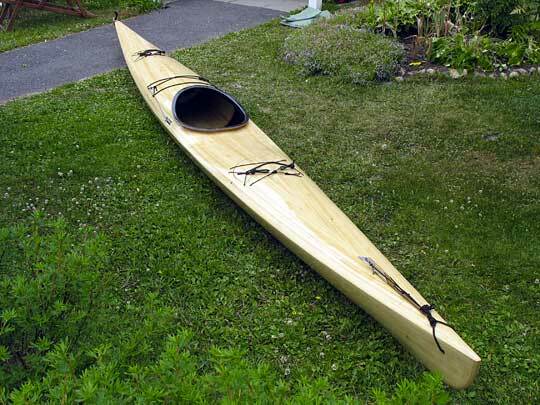 My next project is to make a couple of Greenland paddles. I have paddled a Euro paddle for 40 years now, and it will be interesting to see if my reflexes can adapt. I am taking the boat over to the West Coast Wooden Kayak rendezvous in Port Townsend this weekend. I expect it will attract a lot of interest. Thanks again for your prompt advice, and for the great design. Thanks. I cut individual holes - size of a palm - for both buttocks to one layer of cheap 5mm sleeping matress, then a bit larger hole to a second layer, and finally placed a intact third layer on top the two, and it works fine. Before cutting the holes it felt like sitting on top of something and constantly falling off to either side, maybe it was muscles (or lard) that we sit on that were a bit unstable foundation. Now the sjösättning has been done, finally, after almost 3 years. Actual building hours are between 200-300 h, propably closer to the latter. Setting things up, stapling the strips and glass fibering took perhaps 70-100 hours in total. This was the quick part and where the errors were made. The errors were not that bad, but correcting them and dealing with them was time consuming afterwards. Now when the boat is in water the focus seems to be on the functional issues, but on the building phase the focus was much more on the visual side, how things look. 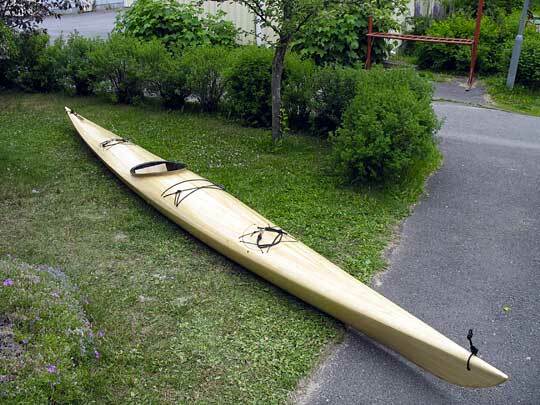 The kayak is a bit over 560cm long (not a mistake), width is 50cm (not a mistake either) or a millimeter less. Bulkheads are 1.5mm thick plywood laminated to hull. Footrest is just a block of stiff closed cell insulation foam, it rests against front bulkhead. Two hatches, openings are around 28cm which seems to be a good = minimum choice if using big watertight bags. Hatches are constructed by using the method Mr. Thomasson describes in Njord's building diary for making the cockpit coaming. The "lip" that the sprayskirt grabs against is omitted, the seal is a piece 4mm thick flat neoprene sheet glued to the hatch. Skeg-box is build through the hull and skeg is retractable. It is operated by a rope which is used for raising it. A bungee chord attached to rear grab loop pulls the skeg out. The rope/skeg is kept in place by a clamcleat. The idea behind this is that if the skeg jams it is easy to be forced out either with a paddle or by an another paddler right on the water. Jamming happened really easy in my previous kayak and was the main inspiration for this, the other being the fact that I was not able to find reliable a method nor materials for glueing the pvc cable of a standard skeg box that is inside the kayak. Cockpit is 38.5cm x 53.5cm (or was it 51.5). It could be shorter, it is not the length but the shape of the opening that counts for more I think. Deck's height is around 1cm lower than instructed at the back of the cockpit, idea was to make entry easier. Otherwise deck is standard. Backrest is a piece of bent plywood padded with foam but it is still not working well enough, it lacks support high enough, it has a tendency to not to stay high enough. Good ideas are welcome. Final weight is to be measured, it was 20.5kg before generous UV-coating and without the wooden hatches, wooden skeg, foam footrest and ropes. Initial goal was to go under 20kg. Strips are spruce (gran), on average 5.1mm thick. Handmade with a cheap handsaw. There are quite a few full length strips. Around one square meter of carbon fiber was used for strength on the inside around cockpit. The amount of epoxy the carbon cloth soaked was amazing, it may explain at least 0.5 or even 1kg of the weight? Stiffening effect was however substantial. Rope fittings are recessed, made out of glass fibre. Handling (based on three outings) is like Thomasson writes, first nervous but stiff when banked. It feels quite resistant to tipping over when banked hard when compared to some kayaks, it doesn't go over easily or with a surprise, there's a relatively big resistance in the end. Loading (full overnight gear) eliminates the nervousness. Skeg feels really necessary in winds over 5m/s when going clearly off the wind. Directional stability feels a bit low in waves, maybe because of flat bottom? but on the other it responds well to body movements. Goes and accelerates quite effortlessly. Haven't measured cruise speeds with a gps yet. An addition to sjösättnings report. The boat handles really well in waves, it is quite playful actually. Short small choppy waves are worst when coming from front, the flat bottom, maybe combined to relatively low weight, tends to bounce not plough through, killing speed. There is a noticeable difference in this when compared to some other boats. Swells from sides and behind are really nice, the kayak does not fall off from course. Surfs well, and skeg helps. Can be paddled cockpit full of water, a nice safety feature. Surfs without a notice with full load, this can be tricky. Based on 5 times out on the sea, totalling a bit over 100km, in winds between 6-11 m/s.